The TI-51-III, known outside of Europe as the TI-55, was introduced in 1977, an age when LED displays were still a pretty hot ticket. 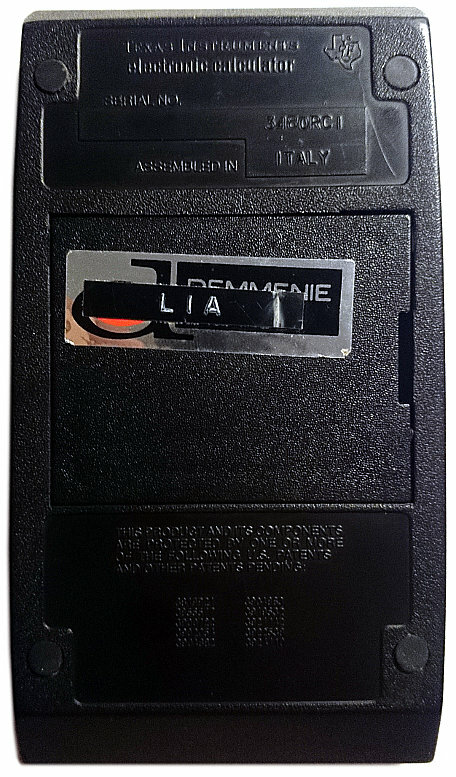 Its part were made in Japan and the device was assembled in Italy. 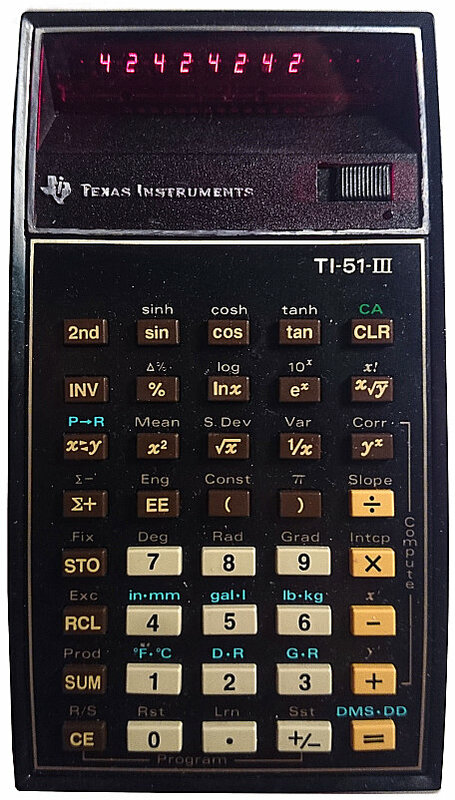 This is a programmable slide rule calculator, an early star of TI's still running series of scientific (and now graphing) calculators, some of which I'm sure will be familiar to you. Its LED display was built to stand the test of time and it burns as brightly as that day when it was first activated in 1977. And what an age it was! Were you to crack this beast open, you'd find a lot less in the way of guts than perhaps you'd expect; the entire calculator resides on a single chip, and the thickness and heft of this device were a matter of ergonomics and pride more than anything else. An important machine warrants an important form factor. This one belonged to Lia. The earthly shackles of machinal calculation cast aside, one can only wonder at the scientific heights that Lia has now attained. Who were you, Lia, who are you - and who will you be tomorrow? It's 148mm high by 78mm wide, and tapers from 33 to 20mm in thickness. It turns on by a slider to the top right of the button pad, and flashes at you angrily when you make a mistake. When I bought this calculator at a thrift shop, it was labeled as nonfunctional. "We shall see about that," I whispered to no one in particular. 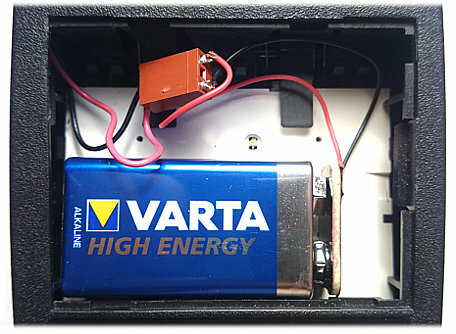 The device does not take normal batteries, rather it uses a rechargable battery pack that was only produced by TI - a handy source of income for them at the time, I'm sure. Needless to say this battery pack wore out a long time ago and Texas Instruments, so I am told, is not in the business of producing fresh batteries for calculators from the seventies. What do? I cracked the battery pack open, and inside I found two AA batteries soldered to a little PCB which contained a charging circuit. The whole mess had been quietly oxidising for about forty years, but I tried to replace the batteries regardless - you never know, after all. No luck, though. I then tried to just solder in a AA battery clip directly to the wire coming out of the calculator; alas, still no luck. The rub lies herein: that little PCB with the charging circuit also contains a step up to 9 volts, which is what the device requires. So the solution was a 9 volt battery, albeit attached the wrong way around, as for this calculator, black is positive and red is negative. Muse on all of that for a second: this calculator could just run on a 9V battery, but it runs on a battery pack. Sure, I hear you say, it was rechargable so you could run the device continually, charging it as you calculated, like you would your smartphone. But ah, I counter, what of those red and black wires? Is there any reason to switch those two around, going against international standards, other than to frustrate the battery hacking attempts of users? In this calculator, I perceive an early example of manufacturers obfuscating and intentionally screwing up their products to hamper the user's right to repair and tinker. Thankfully, it's all easily circumvented, but just keep it in mind when you're shopping for a brand new, full-colour TI graphing contraption. Whatever dark machinations lie behind its design, my TI 51-III now runs like it did in the days of yore. The wall wart is useless and destined for a dusty drawer, but so it goes, I suppose. So if you get a hold one of these old TIs and it won't power up, odds are this is your issue. Take out the battery pack, pop in a 9 volt battery (keeping in mind the switched polarity) and you will once again be able to calculate the frequencies of love, as Lia did so fluently in an age long since past.